For other uses, see -phoresis. Pseudoscorpion hitching a ride on a fly. Phoresis, or phoresy, is rooted in the Greek words phoras (bearing) and phor (thief). It is used to describe a non-permanent, commensalistic interaction in which one organism (a phoront or phoretic) attaches itself to another (the host) solely for the purpose of travel. Phoresis has been observed directly in ticks and mites since the 1700s and indirectly in fossils 320 million years old, but is not restricted to arthropods or animals. Plants with seeds that disperse by attaching themselves to animals are also considered to be phoretic. The term, originally defined in 1896 as a relationship in which the host acts as a vehicle for its passenger, clashed with other terminology being developed at the time, so constraints on the length of time, feeding and ontogeny are now considered. Phoresis is used as a strategy for dispersal, seasonal migration, transport to new host/habitat escaping ephemeral habitats, reducing inbreeding depression. In addition to the benefits afforded to individuals and species, its presence can add to the ecological diversity and complexity of an ecosystem. The strict definition of phoresis excludes cases in which the relationship is permanent (e.g. that of a barnacle surviving on a whale) or those in which the phoront gains any kind of advantage from the host organism (e.g remoras attaching to sharks for transportation and food). In this way, phoresis is a commensal relationship and deviations result in mutualistic or parasitic relationships. Phoretic relationships can become parasitic if a cost is inflicted upon the host, such as if the number of mites on a host begins impeding its movement. Parasitic relationships could also be selected for from phoretic ones if the phoront gains a fitness advantage from the death of a host (e.g. nutrition). Mutualistic relationships could also develop if the phoront began to confer a benefit to the host (e.g. predator defense). The evolutionary plasticity of phoretic relationships allow them to potentially add to the complexity and diversity of ecosystems. Cases in which the phoront parasitizes or preys upon the host organism after travel are still considered phoresis, as long as the travel behaviour and feeding or parasitizing behaviour are separate. Similarly, some pseudoscorpions prey upon the same species that act as their phoretic host. The behaviours are completely separate however, since the pseudoscorpion uses anatomical features used specifically for predation when treating the host as prey, but employs anatomical features used for phoresis when travelling. Examples may be found in the arthropods associated with sloths. The coprophagous sloth moths such as Bradipodicola hahneli and Cryptoses choloepi, are unusual in that they are exclusively found inhabiting the fur of the sloths, mammals found in central and South America. The sloth provides transport to the moths whose females oviposit in the droppings of sloths, larvae feed on it and newly hatched moths move into the forest canopy in search of a new sloth host. Larvae of the blister beetle (Meloe franciscanus) need to find the nests of their host, the solitary bee (Habropoda pallida) to continue their life cycle. 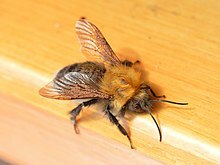 The larvae gather in colonies and emit chemicals that mimic the pheromones of the female solitary bee. Larvae attach to the attracted males when they visit the false source of pheromones, and then subsequently to any female that male mates with. The blister beetle larvae then infest and parasitize the female bee's nest. Some species of Bromeliad treefrog (Scinax littoreus and Scinax perpusillus) carry ostracods (Elpidium sp. ), which in turn carry ciliates (Lagenophrys sp.) from one bromeliad plant to another. The plants act as ecological islands to the ostracoderms and phoresis allows them to disperse over a wider area than would be available to them otherwise. The term for a phoretic organism riding on another phoretic organism is hyperphoresis. A specialist mite (Parasitellus fucorum) that parasitizes bumble bees (Bombus sp.) avoids inbreeding depression in a single hive and to remain genetically independent of any specific host lineage by travelling to a new hive. This is accomplished by travelling on a foraging bee to a flower and detaching, waiting for and attaching to another bee potentially from a new hive, and infesting the new hive. These mites can survive on flowers for up to 24 hours and show a preference for opened flowers, where they would be most likely to encounter a host. The pseudoscorpion (Cordylochernes scorpioides) is frequently found riding harlequin beetles (Acrocinus longimanus). Initially there were a number of alternate hypothesis for why the pseudoscorpions were found on the beetles: by accident, to forage for mites inhabiting the beetle, or as an obligate parasite. Evidence suggested however, that the scorpions were using beetles to travel from tree to tree where they preyed upon other beetle larvae. If their host dies, lice can opportunistically use phoresis to hitch a ride on a fly and attempt to find a new host. ^ Harms, D.; Dunlop, J. A. (2017). "The fossil history of pseudoscorpions (Arachnida: Pseudoscorpiones)". Fossil Record. 20 (2): 223. doi:10.5194/fr-20-215-2017. ^ a b c d e Houck, M A; OConnor, B M (1991). "Ecological and Evolutionary Significance of Phoresy in the Astigmata". Annual Review of Entomology. 36 (1): 611–636. doi:10.1146/annurev.en.36.010191.003143. ISSN 0066-4170. ^ a b c d White, P. Signe; Morran, Levi; de Roode, Jacobus (June 19, 2017). "Phoresy" (PDF). Current Biology. 27 (12): R578–R580. doi:10.1016/j.cub.2017.03.073. PMC 5749251. PMID 28633022 – via Elsevier. ^ a b Zeh, David W.; Zeh, Jeanne A. (1992). "On the Function of Harlequin Beetle-Riding in the Pseudoscorpion, Cordylochernes scorpioides (Pseudoscorpionida: Chernetidae)". The Journal of Arachnology. 20 (1): 47–51. JSTOR 3705790. ^ Binns, E. S. (1982). "Phoresy as migration--some functional aspects of phoresy in mites [Insect dispersion]". Biological Reviews of the Cambridge Philosophical Society. 57 (4): 571–620. doi:10.1111/j.1469-185X.1982.tb00374.x. ^ Liu, Sai; Li, Jianling; Guo, Kun; Qiao, Haili; Xu, Rong; Chen, Jianmin; Xu, Changqing; Chen, Jun (2016-05-06). "Seasonal phoresy as an overwintering strategy of a phytophagous mite". Scientific Reports. 6 (1): 25483. doi:10.1038/srep25483. ISSN 2045-2322. PMC 4858688. PMID 27150196. ^ a b Saul-Gershenz, Leslie S.; Millar, Jocelyn G. (2006). "Phoretic Nest Parasites Use Sexual Deception to Obtain Transport to Their Host's Nest". Proceedings of the National Academy of Sciences of the United States of America. 103 (38): 14039–14044. doi:10.1073/pnas.0603901103. JSTOR 30051982. PMID 16966608. ^ a b Sabagh, Leandro T.; Dias, Roberto Júnio P.; Branco, Christina W. C.; Rocha, Carlos F. D. (2011-04-28). "News records of phoresy and hyperphoresy among treefrogs, ostracods, and ciliates in bromeliad of Atlantic forest". Biodiversity and Conservation. 20 (8): 1837–1841. doi:10.1007/s10531-011-0050-z. ISSN 0960-3115. ^ a b Schwarz, H.H. ; Huck, K. (1997-11-01). "Phoretic mites use flowers to transfer between foraging bumblebees". Insectes Sociaux. 44 (4): 303–310. doi:10.1007/s000400050051. ISSN 0020-1812. ^ Poinar Jr., George O.; Curcic, Bozidar P. M.; Cokendolpher, James C. (1998). "Arthropod Phoresy Involving Pseudoscorpions in the Past and Present". Acta Arachnologica. 47 (2): 79–96. doi:10.2476/asjaa.47.79. ISSN 0001-5202. ^ Sherman, Lee. ""An OSU scientist braves an uncharted rainforest in a search for rare and endangered species" in "Expedition to the Edge"". Terra, Spring 2008. Oregon State University. Retrieved 14 February 2011. ^ Rau, P (1941). "Observations on certain lepidopterous and hymenopterous parasites of Polistes wasps". Annals of the Entomological Society of America. 34 (2): 355–366(12). doi:10.1093/aesa/34.2.355. Retrieved 14 February 2011. ^ Sabagh, Leandro T.; Rocha, Carlos F. D. (2014-05-06). "Bromeliad treefrogs as phoretic hosts of ostracods". Naturwissenschaften. 101 (6): 493–497. doi:10.1007/s00114-014-1178-y. ISSN 0028-1042. PMID 24796544. ^ University of Utah (2008). Ecology and Evolution of Transmission in Feather-feeding Lice (Phthiraptera: Ischnocera). ProQuest. pp. 83–87. ISBN 978-0-549-46429-7. This page was last edited on 1 April 2019, at 13:49 (UTC).